Eighty-two-year-old Zosia Radzikowska, from Krakow, survived the Holocaust by pretending to be Christian. 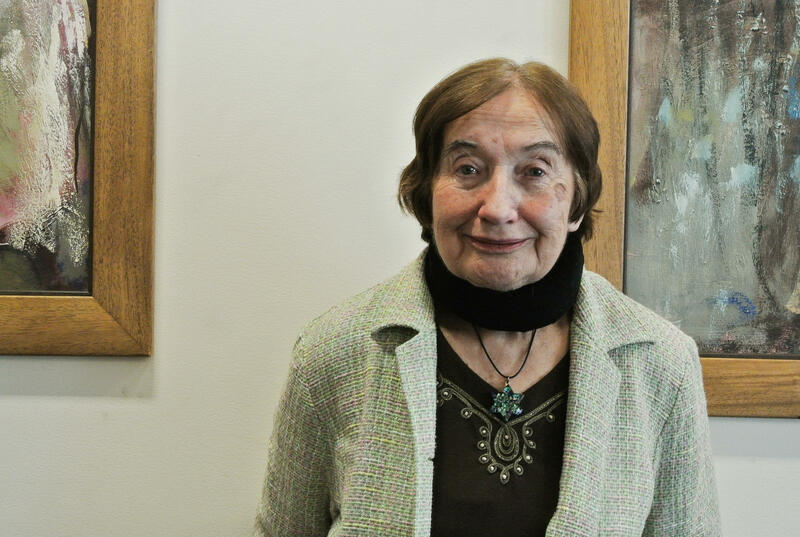 A retired criminal law professor, Radzikowska is an active member of Krakow's small but flourishing Jewish community. 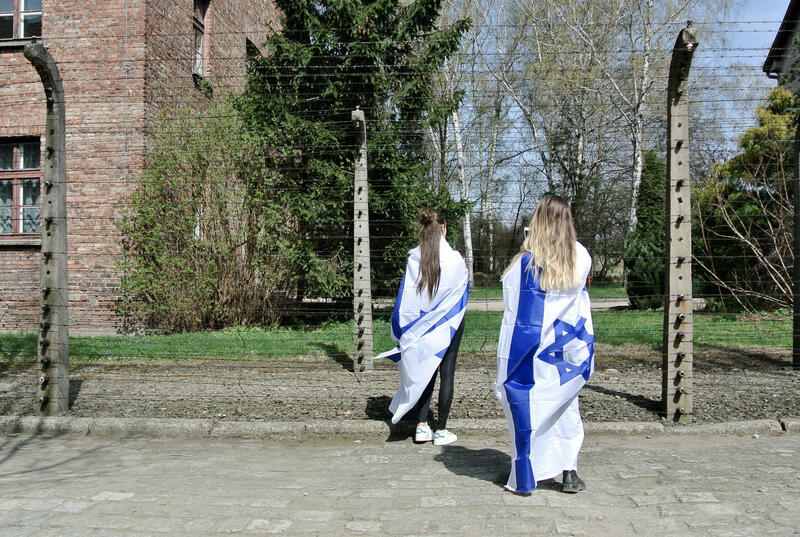 Young participants in Thursday's March of the Living at the former Nazi extermination camp, Auschwitz-Birkenau. 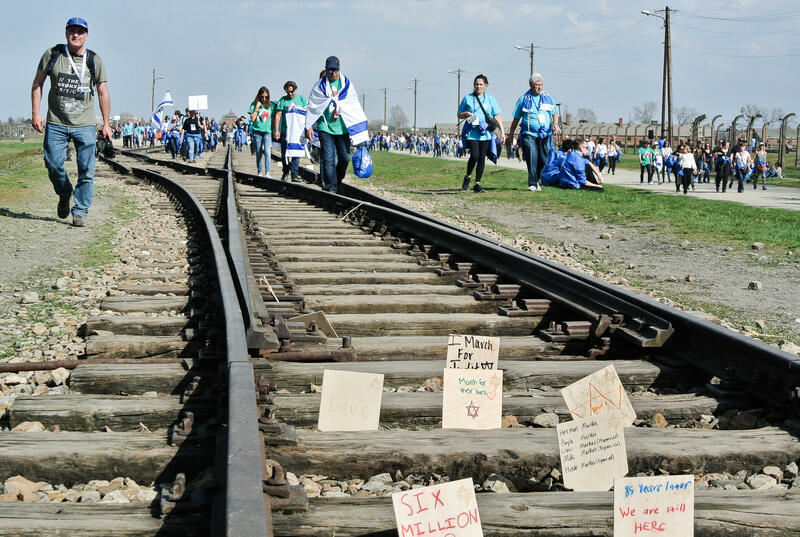 Survivors and the descendants of victims arrive at Birkenau and leave messages in the train tracks for those who perished in the Holocaust. At Auschwitz, death is everywhere, but this monstrous place was full of life this week, as thousands marched through the infamous iron gates to commemorate those who perished during the Holocaust. Many who participated in the 30th March of the Living are elderly survivors or descendants of victims, and they were joined by youth groups from around the world. Most came from places of exile, like South Africa, Canada, the United States and beyond. 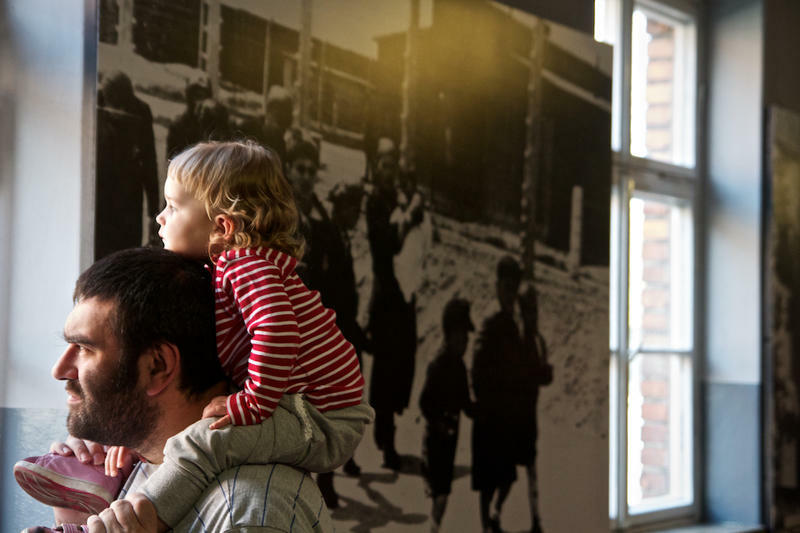 But just an hour from the notorious extermination camp, in Krakow, Jewish life is beginning to blossom again, as more and more Poles discover they have Jewish roots. Attendance is high at a Hebrew for Beginners class at a local community center. One of its most active members is 82-year-old Zosia Radzikowska. She's always known of her heritage. Radzikowska's father died at Auschwitz. She and her mother managed to stay out of the ghetto, and survived the war by pretending to be Christians. But, she says, a fellow Pole took advantage of their desperation. "One day a man came to our home," Radzikowska remembers. "He said he knew that we are Jews and he had to take us to Gestapo." The man blackmailed Radzikowka and her mother until they ran out of money and possessions and were forced to go into hiding. A new law in Poland could criminalize making such an assertion. Attributing crimes to Poland committed during the Nazi occupation could carry penalties of up to three years in jail. Historian Grzegorz Rossolinski-Liebe is writing a book about Polish collaboration with the Nazis. While he's not worried about prosecution, he is troubled by the distorted, historical narrative Poland's governing Law and Justice party is pushing. "The government, they try to control Polish history and protect national, even nationalistic, denial-orientated version of Polish history during the Holocaust," he says. Others in Poland welcome the law, like 18-year-old Oskar Grzib, who was taking part in the march in Auschwitz for the first time. "I think it's a good law," Grzib says, arguing that an entire nation cannot be judged on the actions of individuals. "There were some Polish people that helped the Germans and killed the Jews," Grzib acknowledges, "but for the most of the people, it's not our fault." One survivor, 82-year-old Bill Lewkowict, traveled from Canada to take part in the march. He says he wouldn't be here at all if it weren't for a Polish farmer who took him in during the war and hid him from the Germans. "He was an angel of a man, to whom I owe my life," Lewkowict says. "He took a big risk. There were some Poles that wanted to help, but couldn't help because they were afraid. If they would be found out, they would be shot." Lewkowict says there were few Poles who acted with the same courage as the man who saved him, and makes it clear nothing will stop him from saying so. Poland's President Andrzej Duda stressed this week that the legislation was never intended to silence Holocaust survivors. In a show of solidarity, Duda marched on Thursday at Auschwitz together with Israel's President Reuven Rivlin. At the march, Israel's Ambassador to the United Nations Danny Danon told NPR he wants to see the law revoked. "We hope that this legislation will not move forward. You cannot change history," Danon said. "Many Poles supported the Jews, we know that. Many were not involved. But there were many who cooperated with the Nazis. We should acknowledge reality." While the United States has also asked Poland to rescind the law, Israeli media reported Friday that the White House and State Department have asked the Israeli government to tone down its public criticism of Poland. With the law currently under review, there could yet be a way out of what has become a very sticky diplomatic situation. Poland's constitutional court is due to make a ruling this month. Back in Krakow, 82-year-old survivor Radzikoswka, who taught criminal law at the university there, says the current legislation's wording is meaningless. "It looks like something terrible," Radzikowska says, "but I am a lawyer and I can assure you that we have nothing to be afraid of." Having defied Nazi decrees as a child by refusing to go into the Krakow ghetto, Radzikowska says she's not about to start heeding what she calls "this latest absurdity." Now to Poland. Before the Second World War, Poland was home to Europe's largest and oldest Jewish community. It's also where the Nazis built most of their death camps. A new law there makes it a crime to blame Poland for the Holocaust. That has caused a diplomatic rift with Israel, and historians around the world worry it could impede academic freedom. And yet reporter Esme Nicholson found the survivors refuse to be silenced. She begins her report from the annual March of the Living event. ESME NICHOLSON, BYLINE: Auschwitz, known as a monstrous place of death, was full of life this week as thousands marched through the infamous iron gates to commemorate those who perished here. Many who came are elderly survivors or descendants of victims, and they were joined by youth groups from around the world. In Krakow, just an hour from the notorious extermination camp, more and more Poles who have recently discovered their Jewish roots are signing up for Hebrew lessons at a local community center. Its most active member is 82-year-old Zosia Radzikowska. ZOSIA RADZIKOWSKA: I come here every day. NICHOLSON: Radzikowska's father died at Auschwitz. She and her mother survived the war by pretending to be Christians. But she says a fellow Pole took advantage of their desperation. RADZIKOWSKA: One day, a man came to our home. He said he knew that we are Jews, and he had to take us to Gestapo. NICHOLSON: The man blackmailed them. Poland's new law could criminalize making such an assertion. Historian Grzegorz Rossolinski-Liebe is writing a book about Polish collaboration with the Nazis. While he's not worried about prosecution, he is troubled by the distorted historical narrative Poland's Law and Justice Party is pushing. GRZEGORZ ROSSOLINSKI-LIEBE: The government, they try to control Polish history and protect national - even nationalistic denial-oriented version of Polish history during the Holocaust. NICHOLSON: Others in Poland welcomed the law 18-year-old Oskar Grzib, who is taking part in the march. It's his first time at Auschwitz. OSKAR GRZIB: I think it's a good law. NICHOLSON: He says an entire nation cannot be judged on the actions of individuals. GRZIB: There were some of the Polish people that helped the Germans and killed the Jews. But for the most of the people, it's not our fault. UNIDENTIFIED TOUR GUIDE: It's a memorial space and a museum. NICHOLSON: Eighty-two year old survivor Bill Lewkowict has travelled from Canada to be on this march. He says he wouldn't be here at all if it weren't for a Polish farmer. BILL LEWKOWICT: He was an angel of a man to whom I owe my life. NICHOLSON: The farmer took Lewkowict in during the war and hid him from the Germans. LEWKOWICT: He took a big risk. There were some Poles that wanted to help but couldn't help because they were afraid. If they would be found out, they would be shot. The sad part is there were few and far between this kind of people. NICHOLSON: Lewkowict says there were few Poles with the same courage as the man who saved him, and nothing is going to stop him from saying that. Poland's president, Andrzej Duda, stressed this week that the legislation which is currently under review was never intended to silence Holocaust survivors. Back in Krakow, 82-year-old survivor Radzikowka, who taught criminal law at the university there, says the legislation's wording is meaningless. RADZIKOWSKA: It looks like something terrible. But I am a lawyer, and I can assure you we have nothing to be afraid of. NICHOLSON: Having defied Nazi decrees as a child by refusing to go into the Krakow ghetto, Radzikowka says she's not about to start heeding what she calls this latest absurdity. For NPR News, I'm Esme Nicholson in Krakow. Transcript provided by NPR, Copyright NPR. Museum director Sara Bloomfield says that’s the starting place for the new “Never Stop Asking Why” digital campaign, launched to mark the 25th anniversary of the institution by engaging new generations on the lessons of the Holocaust. “Why did the Holocaust happen? What made it possible? How could it have been different? What does it mean for me today?” she said.